Next post: TV Flashback: Magnum, P.I. 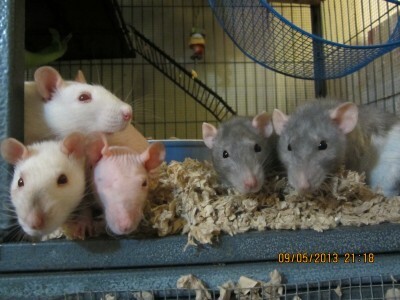 Rebecca shares with KRL another fun story from the perspective of her pet rats. This one may resemble a certain musical. Willow: a high-strung blue and white doe, mother of fifteen. 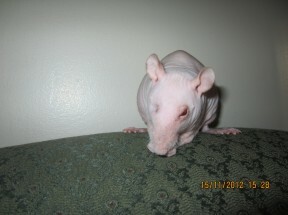 Gonzo: the notorious one-eyed hairless hermaphrodite, mother of eleven. 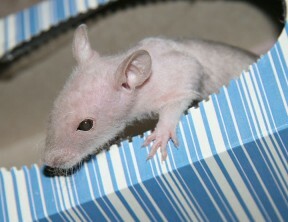 Cloud: a refined Himalayan rat, a rescue who moved to the Rattery with her young daughter. Bob: a sweet, but not too bright little blue doe, Sister to Willow. Sitting round a table fashioned of a Q-Tip Box, the mother does enjoyed a late brunch, compliments of their offspring and indulgent owner. There were scrambled eggs, sliced fruit, and veggies with a little brown bread to round out the edges of the meal. As the hustle of snagging the best pieces of food died down, the does began to compare notes on Mother’s Day and how their individual sessions with their offspring had gone. 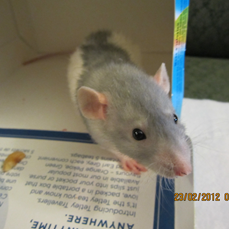 “I got ear cream,” volunteered Cloud, who was considered a very fancy rat. She went to the salon regularly to get her tummy bleached and have her ears and nose darkened. The other does suspected a little tail waxing was also done on the sly, but of course no one dared bring that up. The other does thought about this. They were unable to recall if they’d ever seen another rat with wrinkly ears, but perhaps this ear cream stuff was the reason. All resolved to put it on the grocery list. “So what did your babies get you, Gonzo?” asked Cloud. “They just make me awesomer, not a daddy! I know who my babies’ daddy is and he owes me cashews!” snapped Gonzo. “I’d like to point out that some of us had more than that,” preened Willow, who held the rattery’s record with fifteen babies, all who lived to adulthood. “Gonzo’s babies beat everyone up,” Bob mourned dolefully. She had recently been held upside down and deprived of a strawberry by Gonzo’s biggest baby, Snowball. “Ya Gonzo, you needa speak to your babies about that,” agreed Cloud, who privately thought that Gonzo’s four white daughters, the biggest rats in the entire cage, could use more than just a little talking to. “And how!” muttered Cloud into her piece of watermelon. “I was a teen mom with no family to support me,” began Gonzo, launching into the familiar story. The other does silently groaned and focused on their food. “Separated from my mother at a very young age, I was saved from being snake food and rescued by a lady who thought I was a boy and then I got sent here where they also thought I was a boy. The boy rats figured out that I was both and we had an awesome time until Mom freaked out on us. She said that I probably wasn’t pregnant, but I got to be the size of a tennis ball and then one day…”she left a dramatic pause, “I made babies. Lots! And even though I hairless and we terrible at nursing babies, I was awesome at it and all my babies made it and now they’re big enough to beat us up,” she finished in triumph. “And that’s a good thing?” asked Willow, drily. “Snowball seems to like it,” said Bob, scarfing a piece of pineapple. She was so happy to have been invited to a brunch where the babies couldn’t take food from her, she couldn’t care what conclusions Gonzo drew. “At least I not a baby-eater,” muttered Gonzo. Willow spat out a piece of bread, stung by the accusation. “Bet there were sixteen and you ate one!” taunted Gonzo. 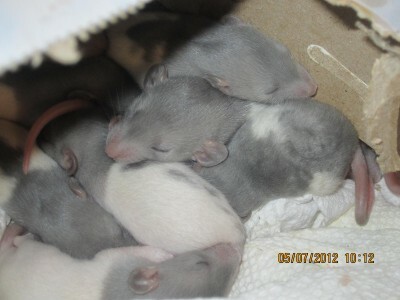 Check out more of Rebecca’s rat stories in KRL’s rodent ramblings section. I love this tale! And the photos are beautiful. their dutiful approach and unbridled pride in their offspring. Gonzo’s attitude about being different does indeed make her awesomer. Happy Mother’s Day to creatures every where. Best job ever. Thanks Mom. Happy Mother’s Day and thanks for not eating me. 😀 Gonzo is looking forward to your next visit. You are definitely welcome. It is hard to not eavesdrop when the ratties hardly ever shut up. Gonzo is especially proud of herself lately: she recently won a contest at our local vet clinic for a first aid kit (Gonzo’s story about “cage-fighting” tickled their collective funnybones) and Gonzo is now participating in a contest to get her picture in a book about hairless rats! I absolutely LOVE hearing these rat tails. Er. Um. I mean TALES. Ha! Aha ha. 😛 Thanks Lori; looking forward to seeing what the rats get up to for Father’s Day. Maybe it’ll be nice enough that they can BBQ? Betcha they’d LOVE grilled corn on the cob!